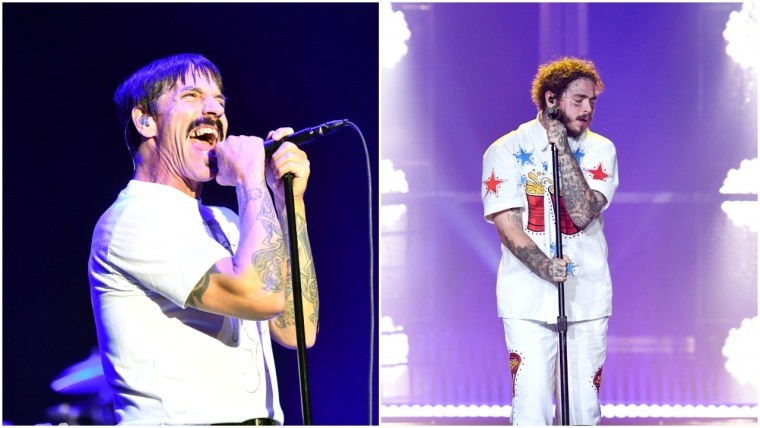 As promised, Post Malone and the Red Hot Chili Peppers took the stage and performed together at the 2019 Grammys. Post Malone started solo with an acoustic version of "Stay" before ditching the guitar for his verse on "Rockstar." His performance, unfortunately, did not feature a significant shout out to the song's featured artist 21 Savage, who was arrested by ICE last week (his adlibs could be heard near the performance's end. Malone and the Chili Peppers then united to play RHCP's “Dark Necessities.” Watch video below via Stereogum. Post Malone is nominated for four awards at the 2019 Grammys: Best Pop Solo Performance ("Better Now"), Best Rap/Sung Performance and Best Record ("Rockstar"), and Album of the Year (Beerbongs & Bentleys).